The first appointment of the European project GEOENVI aimed at tackling environmental concerns for the use of geothermal energy and propose new technological and normative solutions. Rome 18.04.2019 The GEONVI project was presented this morning in Rome. The project, supported under Horizon 2020, is aimed at implementing a planning strategy together with public decision-makers to ensure that deep geothermal energy can play an important role in the development of energy systems, in line with the principles of sustainability. The conference was opened by Mr. Davide Crippa, Undersecretary of State of the Ministry of Economic Development: “The decision to include geothermal energy within the Fer2 decree stems from the need to respond to new requirements for emissions, which is also the basis of the GEOENVI project, fundamental precisely because of its ability to identify forward-looking ideas for the abatement of polluting systems and also for the promotion of new technologies”. The Undersecretary then illustrated the Government's forthcoming initiatives, announcing a consultation aimed at tracing simplified operational guidelines and procedures connected to geothermal installations, with an eye also to the optimal planning of the refurbishment of existing installations. As for new installations, Mr Crippa underlined instead the priority to realize a balanced and punctual plan to tackle emissions reduction, aiming at the best technologies ". "The development of renewable sources and decarbonisation represent a great opportunity for economic growth, environmental improvement and the promotion of the Italian supply chain, especially in the case of technology such as geothermal energy, an element of excellence for our energy system", commented Simone Mori, President of Electricità Futura. "The goal of the GEOENVI project, widely shared by Elettricità Futura, is to implement this technology through solutions that are environmentally acceptable as well as harmoniously integrated with our territory. The numerous adhesions by Italian partners to this project demonstrates the will for our sector, to realize inclusive planning that will see in the Decree Fer2 an effective tool”. As highlighted by Philippe Dumas, EGEC Secretary General and coordinator of the GEOENVI project, "The geothermal energy market in Europe is developing strongly: the installed electric power in 2018 has indeed exceeded 3 GWe (with annual production of over 21 TWh), and 300 geothermal district heating plants and 2 million geothermal heat pumps are currently in operation. In Italy, geothermal energy is an important industrial sector, which involves small and large companies, is highly innovative and exports all over the world, also thanks to a historically strong and consolidated internal market". The topic of research and innovation in the geothermal sector with particular reference to minimizing environmental impact was developed by Riccardo Basosi, Italian Energy Representative in Horizon 2020 and MIUR Delegate for the EU Strategic Energy Technology Plan (SET Plan). In his speech, Mr Basosi highlighted the substantial commitment of Italy that participates in 12 Projects out of 18 financed by the European Commission and coordinates 4 with a success rate and financial recovery of 13.5% of the total expenditure, for an amount of € 20 million. One of the strengths of the GEOENVI project, according to Loredana Torsello, head of international projects of CoSviG and Italian referent for the SET Plan on deep geothermal energy, is the effort that the project partners are dedicating to defining a rigorous and reliable methodological path that could nevertheless become an accessible and available tool for public decision-makers involved in defining regulatory and authorization procedures that could enable the development of geothermal energy consistent with the criteria of sustainable development of the energy and territorial systems involved. This will give the operators a strong push to adopt a shared technical and scientific approach at European level with regards to evaluation methodologies. Moreover, thanks to the sharing of a robust and shared methodological approach for the evaluation of impacts, citizens and local communities will be able to mitigate their concerns and contribute in an informed way to the definition of development of geothermal energy more consistent with the sensitivities and the vocations of the territories involved. Daniele Fiaschi, associate professor of Renewable Energy and Energy Systems at the University of Florence and coordinator of the Italian group in the inter-university consortium CSGI, partner of the GEOENVI project, showcased the approach for the harmonization of the parameters for the environmental impact assessment guidelines of deep geothermal energy, which is one of the primary objectives of the project. Among these, the PES (Primary Energy Saving) allows for example to estimate the role of geothermal energy in the national thermoelectric landscape and its contribution to the reduction of polluting emissions deriving from the use of fossil fuels. The mitigation of environmental impacts is already a reality based on numerous environmental parameters, as highlighted by Adele Manzella, a representative for CNR working group partner of the project and President of Unione Geotermica Italiana. Italy and Tuscany are at the forefront of this sector, and GEOENVI will describe and compare available technologies, including monitoring technologies, and methods to address and minimize critical issues, starting with the legal provisions already in force in various countries. "Enel Green Power has inherited and developed this important technology that is part of the heritage of our country's history," commented Carlo Pignoloni, Enel Green Power's Renewable Energy Manager. According to Mr. Pignoloni, “Thanks to continuous interaction with the institutions, [EGP] has been tracing a path of sustainable development within the industrial value- chain, with innovative solutions that favor the re-use of heat and CO2 to favor the economic and social development of the territory, also with an eye towards circular economy ". In conclusion, Maria Laura Parisi, Researcher at the University of Siena and national co-chair of the Renewable Energy and Sustainable Technologies working group of the Italian Association LCA, illustrated the objectives of the GEOENVI project for the proposal of guidelines for the use of LCA methodology aimed at assessing the environmental performance of geothermal systems. In this context, Ms. Parisi highlighted the crucial methodological aspects for the definition of a standardized approach for the calculation of the eco-profiles of plants for a geothermal generation. Geothermal energy utilisation in The Netherlands has been experiencing a tremendous growth in recent years, mainly due to the development of policy instruments that tackled barriers such as geological uncertainty and the difficulty in ensuring adequate financing. During the opening ceremony of the GeoTHERM Exhibition and Congress 2019, the Ruggero Bertani European Geothermal Innovation Award 2019 was awarded to the Swiss company Jansen AG, for their Jansen HIPRESS borehole heat exchanger, a novel technology for applications in depths of 300+ meters, that allows the exploitation of high temperatures at greater depths improving, at the same time, the efficiency of the heat pump. 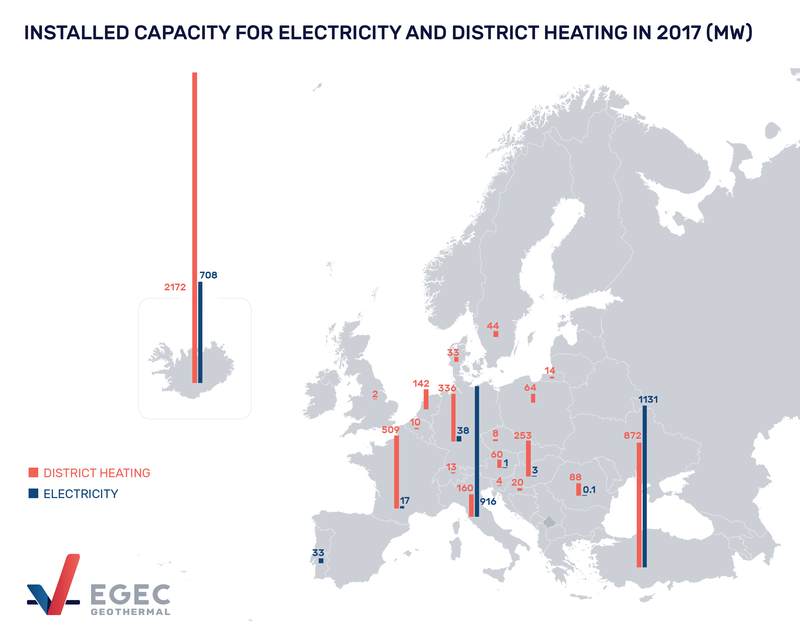 More than 120 members from 28 countries, including private companies, national associations, consultants, research centres, geological surveys, and public authorities, make EGEC the strongest and most powerful geothermal network in Europe, uniting and representing the entire sector.